Syrians filed more than twice as many asylum applications as any other origin group during Europe’s record migration surge in 2015 and 2016. In response, some European countries such as Germany prioritized the review of Syrian asylum applications above other nationalities of asylum seekers and approved a greater share of them than non-Syrians. In all, more than half a million asylum seekers from Syria during the 2015-16 surge had received permission to stay in Europe, at least temporarily, as of Dec. 31, 2016, according to Pew Research Center estimates of data from Eurostat, the statistical office of the European Union. Syrians not only filed the most applications, they also had the highest share of approved applications of any asylum-seeker origin group. 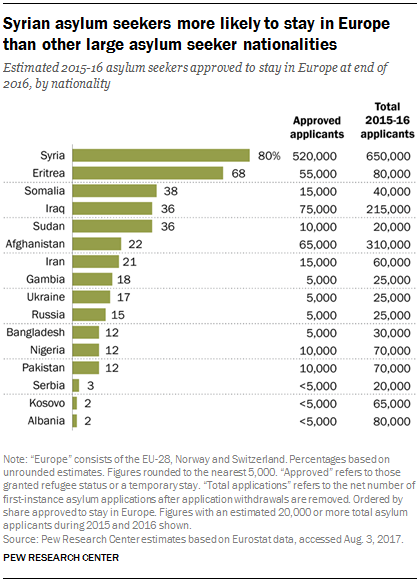 Among nationalities with the most asylum applications in 2015 and 2016, estimates show the share of Syrians (80%) permitted to stay in the European Union, Norway and Switzerland was far higher than the share among Eritreans (68%), Somalians (38%), Iraqis (36%), Sudanese (36%) and Afghans (22%). Overall, about 40% of Europe’s 2.2 million asylum seekers during this time had their applications approved as of Dec. 31, 2016. About half (52%) are still waiting for an application decision, according to the Center’s estimates. Meanwhile, about one-in-five Syrian applicants (20%) are still waiting for a decision, a much smaller share than other nationalities. The conflict in Syria has displaced an estimated 12.5 million Syrians worldwide over the past six years. The resulting migration crisis drew widespread attention around the world in 2015, with the publication of a photo of a 3-year-old Syrian boy’s body lying face down on a beach in Turkey. In 2015 and 2016, Europe became a destination of choice for an estimated 650,000 Syrians. However, this represents only about 5% of all Syrians displaced by the conflict worldwide. Most displaced Syrians continue to live away from their homes within Syria or in Turkey, Jordan and Lebanon. These Europe-bound Syrian refugees crossed the Eastern Mediterranean from Turkey to Greece and applied for asylum in Europe. Most Syrian asylum seekers who arrived in Europe did not stay in Greece but instead continued their journey into Northern and Western Europe after Germany temporarily withdrew from the Dublin Regulation, which requires member states to register asylum seeker applications in the first European country they enter. View country by country status of Europe’s asylum seekers with an interactive chart. See Pew Research Center’s interactive on the refugee status of Europe’s asylum seekers by nationality and country of application. Asylum seekers seeking refugee status in Europe must apply individually and demonstrate to government officials that they would, at minimum, face serious persecution due to race, religion or other factors if they returned to their home country. Approved refugees receive work permits and some may begin the process of applying for family members to join them. Decision times on applications for Syrian asylum seekers varied by country across Europe. In Belgium, for example, Syrian applicants were prioritized but decision wait times still averaged several months. 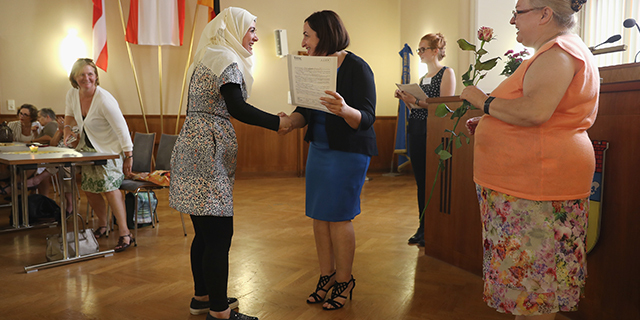 Many Syrians applying in Germany received decisions within three to four months of their initial application, much shorter than many other nationalities. This drove down the average wait times in Europe, since Germany accounted for more than seven-in-ten Syrian application approvals (72%). In many other countries, the wait times for Syrians, as well as asylum seekers of other nationalities, took longer – sometimes a year or more. In most European countries, a majority of Syrian asylum seekers had their applications approved in 2015 and 2016. However, the highest and lowest shares of Syrians given permission to stay varied by EU country. For example, estimates show that nearly all Syrian applicants in Sweden (96%) could legally stay in that country as of the end of 2016. Germany – the country with the highest number Syrian asylum seekers in 2015-16 – had approved 89% of asylum applications filed by Syrians, nearly matching Sweden’s share of approved applicants. At the lower end, about one-in-ten Syrian asylum seekers in Greece are estimated to have had their applications approved, with most others still waiting for a decision on whether they can stay in Europe. Unsuccessful first-time applicants may appeal a rejection and wait for a final decision on their future in Europe. Estimates show that most Syrian asylum seekers whose application has been rejected appeal the decision, with few returning to Syria or moving to a non-EU country.